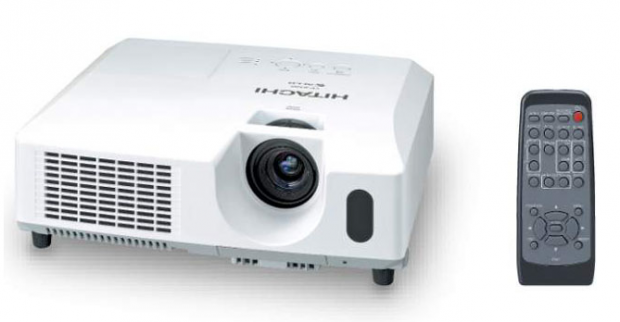 Hitachi Japan has announced a total of four new video projectors [JP] specifically aimed at businesses today. The devices will hit Japanese stores on December 21, but Hitachi hasn’t said yet if the projectors will be sold outside this country as well. The flagship model, the CP-X4020J (pictured above), produces 4,000 lumens brightness and comes with a 260W lamp. The CP-X3010J (3,000 lumens), the CP-X2510J (2,600 lumens) and the entry model CP-RX80J (2,200 lumens/pictured below) have just a 210W lamp, but all four devices feature a contrast ratio of 2,000:1 and 1,024×768 resolution. The CP-RX80J comes with a 1W internal speaker, while the other three models have a 16W (mono) speaker on board. All of these projectors feature a “template function” for business presentations Hitachi introduced back in May last year. Prices in Japan: $6,600 for the CP-X4020J, $2,300 for the CP-X3010J and $1,900 for the CP-X2510J. The price for the entry model is open.